A chance to see exotic animals at night makes an evening visit worth a trip, and through January 3 the zoo is also decked out with holiday lights and special performances. Expect music, animal-themed Christmas tales, and Santa holding court in an igloo while his elves bounce on a trampoline. Tying the wacky vibe together is the large, tropical toog tree in the zoo’s Front Plaza, outfitted with a musical light display featuring over 1000 bulbs. It’s free with paid admission, and the zoo stays open until 8 p.m. during the holidays (no Jungle Bell festivities on December 24). $40 children, $50 adults. 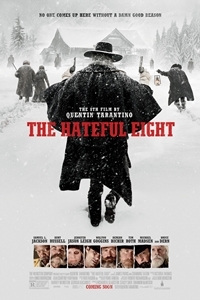 Quentin Tarantino’s new film, The Hateful Eight, comes out on Christmas Day and with it new life for the 70mm projector that, for the past 20 years, has been gathering dust in the booth of the Grossmont Theatre. Reader movie critic Scott Marks spoke with Reading Cinemas projection guru John Sittig, who discusses what it took to bring the film shot in an outmoded format to a theater near you and provides an entertaining history of the wide-gauge ratio. Why bother with IMAX when you can enjoy it in 70mm on Grossmont’s 60-foot screen? Richard Powers (center) is an internationally known vintage dance historian and teacher. Saturday, December 26, 2015, 9:30 a.m. to 10:15 p.m.
Waltz & Such and the San Diego Vintage Dance Society offer two days of dance workshops with the Richard Powers and long-time teaching partner Angela Amarillas, a 1915 Boxing Day Ball with the Heliotrope Ragtime Orchestra, and an early Jazz Age Tea Dance with the Gordon Kohl Trio. Saturday $70; Sunday $45. Sunday, December 27, 2015, 4 p.m.
Comedian Doug Benson hosts a podcast where he talks to surprise guests about his first love, movies. Benson began his weekly show in 2006 in front of a live audience at the Upright Citizens Brigade Theatre in Los Angeles. His guests have included Zach Galifianakis, Sarah Silverman, Patton Oswalt, Jon Hamm, Adam Carolla, Aziz Ansari, and Amy Poehler. To have a chance at winning some prizes, bring a movie-themed name tag. This fast 13.1-mile course now starts on Peñasquitos Drive in front of the Doubletree Golf Resort and travels southwest along Carmel Mountain Road (your only “real” hill is at mile 1.5), along the SR-56 bike path, and finishes at Torrey Pines State Beach. The race includes a 711-foot net elevation drop along the rolling downhill bike path. This winter half has been a sell-out event every year. There are two kinds of alt-rock fans: Cracker fans and Camper fans, so the frontman for both bands, David Lowery, has got you covered. In advance of their split bill at Belly Up Sunday night, Lowery talked with Reader contributor Dryw Keltz. Monday, December 28, 2015, 9 p.m. to 10:30 p.m.
A monthly stand-up and sketch comedy variety show featuring local and Hollywood comedians on the fourth Monday of every month. This month's sketches performed by returning favorites Pat Puccini, Austin Train, and Rachael Dana. Tuesday, December 29, 2015, 8 p.m. The on-again, off-again New York indie-rock quartet that Rolling Stone magazine called “the best band you’ve never heard of” is — you guessed it — on again! Dean Wareham and company are playing two West Coast shows this week, Tuesday night at Casbah and New Year’s Eve at the Starline Ballroom in Oakland. Thursday, December 28, 2017, 10 a.m.
Head over early on December 30 to the corner of Harbor Drive and Ash Street to purchase your grandstand ticket. $20 cash. With 100,000 spectators expected, if you score a seat you’ll be a lucky one. The Holiday Bowl Parade marches at 10 a.m., the largest balloon parade in America. Hang around until 11:45 and you can hear the Battle of the Bands on the Broadway Pier.